We read a lot of books at our house. We have an ongoing list of books we want to read for our next read aloud or individually. Once in awhile we will find a book that needs to be moved to the top of the list and then there are the books that interrupt our current one. 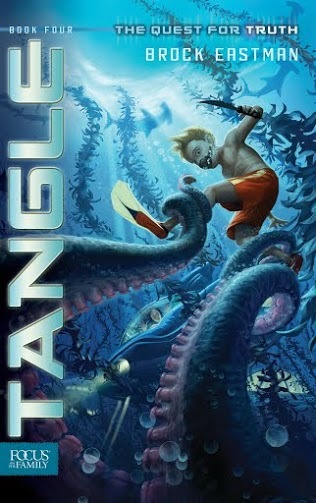 That is what happened when we received our copy of Tangle, to save a fight over who got to read the book first we decided to use it as our read aloud and we didn't even finish the book we were on. The Quest For Truth series is about the four Wikk children in a race to find the planet Ursrung and stop the renegades and Corsairs for misusing its long lost secrets. They have been separated form their parents and must learn to trust one another while they visit ancient cities, encounter villains, and learn to use futuristic gadgets on their quest. Tangle is the fourth book in The Quest For Truth series. The Wikk kids have been captured and separated from one another. They learn of the Rescuer and must rely on his power to help them on their journey. Oliver, Tiffany, and Austin encounter danger while they try to rescue their friend Ashley from a toxic moon while Mason and Obbin are reunited with their parents in captivity. We love this series and Brock Eastman's writing. We dropped everything to read this book & when I read the last page Amber asked if we could stay up later to read more. I told her it was the end of the book and she said, "I hate reviewing because that means we have to wait for the next book to come out, we can't just finish the series!" It is nice to read an author that can show kids their need for the truth and how they can be comforted by it in stressful situations within a good story. Brock has done a great job giving us plenty of adventure, science fiction, and showing us how the Wikk children have matured and developed self control and respect for one another. It is very easy to see the spiritual growth in the characters in their thoughts and actions. I loved listening to my mom read Tangle. It's so exciting to hear what the next chapter is about and what happens to Oliver, Tiffany, and the Twins. I love the adventure and the anticipation. The Quest For Truth is such a good series. I love the plot, adventure, and characters. I'm very thankful for Brock's adventurous writing style and that I don't have to worry about inappropriate scenes and foul language. Brock Eastman works for Focus on the Family and as a Producer for Adventures in Odyssey. He started The Quest for Truth series in 2005 and signed a publishing deal in 2010. He has also written Sages of Darkness and a book for the Imagination Station series. He is always thinking of his next story and has a thumb drives full of ideas. All four books are available in an autographed paperback, on iBooks, or Amazon. 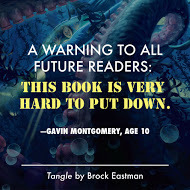 Disclaimer: I received a free copy of the book Tangle from Brock Eastman to aid in my review. All opinions are my own and no other compensation was received. Wordless Wednesday What is Hiding in our Donuts?